I’ll admit, I was a little hot in this sweater! We got hit with 90+ degree weather the last few days and it was definitely a surprise. We rarely get this warm of a weather over Memorial Day weekends. I love the vibrancy of the colors in these stripes AND (broken record alert) I love the touch of red, obviously. The blue in the socks picks up the blue from the sweater and even though the socks are in a completely different stripe style, I think the two work together in an unexpected way. 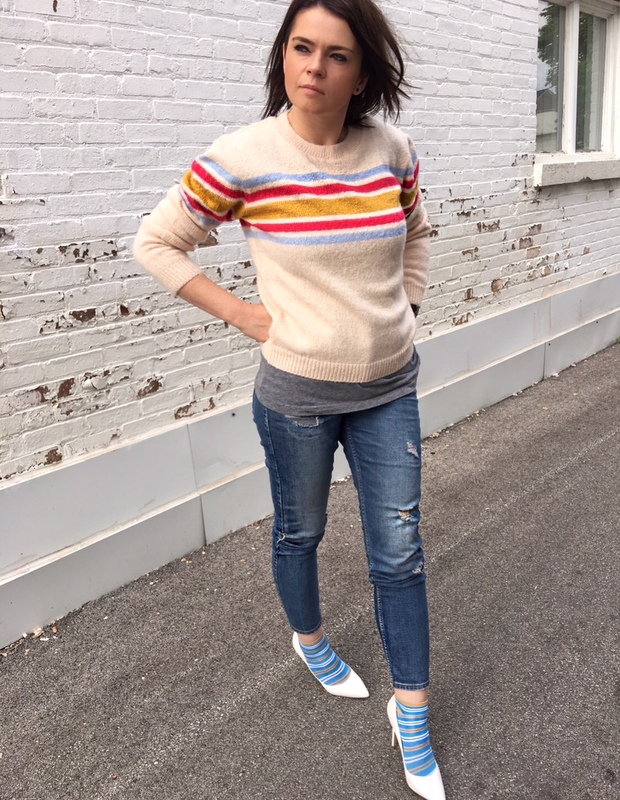 I love the sock / shoe look and have been wearing the two together way back when before my blogging came about LOL. It’s not for everybody, I know, but I think it adds so much more interest to an outfit. Wearing: Nobody’s Child sweater; H&M jeans (sold out, but almost identical here and here); Charles David pumps (old, identical here and here); no name socks (similar here and here). 1. Hope everyone is having a great long Memorial Day weekend. Thinking of those who are gone, my dad especially, today and always. Not an hour goes by on any given day without him crossing my mind. 2. Elliot, my 3 year old, all of a sudden goes this morning ‘I just like the combination of gummy bears and meat’ LOL. WHO.IS.THIS.KID ?? How to style a colorful headband! Thank you so much! I love wearing socks and pumps or sandals together! Rubi, thank you! So inexpensive, but makes an impact, right?